Addressing the still pressing need for potable water a month on..
MWF Program Officer Franz Nikko Lacsina (foreground) spearheads the deployment of potable water, which was made in partnership with Ayala Education, PRC CamSur Chapter and UNC. The first half of this initiative, which was carried out through the Foundation’s Agapay Para Sa Barangay (APSB) program, benefited 2,000 hard-hit families from Camarines Sur and Quezon, two of the most severely affected by the typhoon that displaced over 300,000 families. More than a month after the calamity, clean and potable water is still a concern and a pressing need among some municipalities in the province of Camarines Sur. To address this, MWF provided another 2,000 units of 5-gallon bottled water to the municipalities of Buhi and Camaligan which were among the most affected in the province. According to Philippine Red Cross (PRC) Camarines Sur Chapter Administrator Maria Theresa Bongiad, while all of the 35 municipalities and two cities of the province were affected by the typhoon, the chosen municipality beneficiaries were glaringly left with compromised water supply conditions due to the damages and flooding caused by the typhoon. “Yung tubig [mula sa Manila Water Foundation] ibibigay natin sa mga municipality na nagkaroon ng water contamination kasi nagkaroon ng leak yung kanilang pipes. 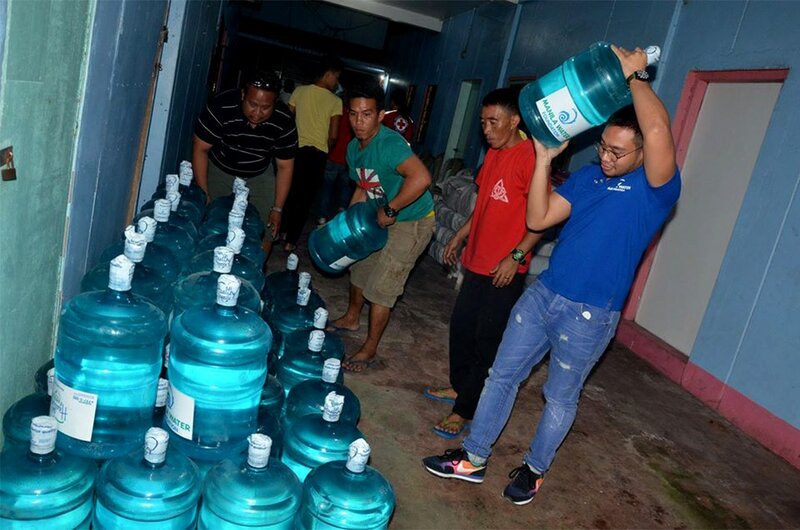 Malaking tulong talaga ito sa kanila kaya maraming salamat,” (The water assistance from Manila Water Foundation will be distributed to municipalities where cases of water contamination were reported due to damages in water pipes caused by the typhoon. This assistance will surely be of great help and we are very grateful.) Bongiad thankfully quipped. This response, which was made possible through the endorsement of Ayala Education to the PRC CamSur Chapter and the University of Nueva Caceres (UNC), will help 1,800 families in Buhi and 200 more in Brgy. Sua-Tampac, UNC’s adopted barangay in Camaligan that is still in dire need of continuous assistance. Aside from MWF’s continuous support in the provinces hit by Typhoon Nina, the APSB program is ironing out its plans to help areas in Mindanao where thousands of families, including their livelihood, were placed in peril by the recent flooding.